If you’re the type of person that doesn’t like to be talked to while you’re at the gym, is silently impressed at your own calculated responses, and might see yourself as the intellectual, studious type (whether that’s true or not), this story will captivate you. The Secret History is obsessed with Greek tragedy—conflict, beauty and fate. It’s full of wise sayings in Latin and Greek, with a sprinkle of French one-liner commentary throughout. These fragments of antiquity are admitted so seamlessly from the first to last page that one feels deservedly inducted into this secret society of brilliant, tortured, perfect souls. My biggest qualm is the narrative moves at a great pace until about two-thirds in, but seems to slow infinitely until the very end. It seems about two-thirds in that the major conflict of the book is entirely resolved, leaving one feeling as solitary as the narrator has been all along, pondering the purpose of moving forward. That being said, the ending is rather worthwhile. While somewhat predictable, the actual unfolding of plot will have you exclaiming aloud, and then chuckling through the epilogue while dealing with a hearty plate of mixed emotions. 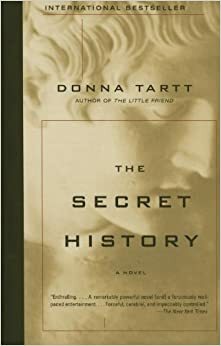 Overall, The Secret History is a worthy read; good momentum, entrancing setting, descriptions that inspire one to tab many pages with post-it notes and a fulfilling sense of closure at its completion. A fiction work that will enrich your life, it’s a tremendous accomplishment.